BricsCAD provides a set of properties for 3D constraints which allow to control mutual placement of the constrained geometrical entities (or constraint arguments) upon 3D constraints recalculation. The properties may be assigned both to a constraint itself (Directions property) and/or to the constraints arguments, for each argument separately (Placement and Use as properties). Directions property specifies whether the directions of the constraint arguments are Same or Opposite. Changing from one to another results flips constrained entities with respect to each other.. Direction has sense for lines, planes, circles, cylinders, cones and torii. It has no sense for points and spheres. Direction of a plane is its normal vector. Direction of a circle is the normal vector of the circle's plane. Direction of a cylinder, cone, or torus is the direction of its axis. The direction of a planar face of a 3D solid is additionally adjusted to be external w.r.t. the 3D solid object. Any option means that the directions may change upon direct modelling operations or upon a 3D constraint parameter change. 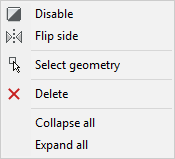 Keep option forces BricsCAD to keep the current directions. In other words, this option forces BricsCAD to analyze the mutual location of the arguments prior to 3D constraints solving and use either Same or Opposite (not both). Placement property specifies how to place an argument with respect to another argument of the same constraint. For example, a point in a point-sphere distance may be placed either Outside or Inside of a sphere. Changing this property for a constraint argument moves the argument to the other side of another argument. The sides are defined for planes, spheres, cylinders, cones, and torii. And not defined for points, lines, and circles. Any option means that both Outside and Inside placement is suitable for user's intentions. Keep option forces BricsCAD to keep the current placement of the argument. In other words, this option forces BricsCAD to analyze the mutual location of the arguments prior to 3D constraints solving and use either Outside or Inside (not both). By default Keep option is used. Use as property is assigned to the arguments of the Distance and Concentric constraints. It has sense for circles, spheres, cylinders, cones and torii and defines which geometry is used in a 3D constraint to measure the distance or to made coincident with the other entity. Vertex can be applied to the cone vertex only. Disable/ Enable: Toggles the selected constraint ON/OFF. The Enabled field in the Properties grid is adjusted accordingly. Flip side: Allows to change the relative position of an entity (vectors normal of the selected faces point in the same direction or in the opposite direction). This option can be applied to Parallel, Coincident and Concentric constraints only and on condition the constraint is applied to faces. Select geometry: Selects the geometry, that is affected by the constraint, in the drawing. Delete: Deletes the selected constraint. Collapse all: collapses the main component and all components and subcomponents. Expand all: expands the main component and all components and subcomponents.